Back in May, Microsoft unveiled the Surface Laptop at the #MicrosoftEDU Event. The first Surface device to ship with Windows 10 S was enthusiastically, passionately described by Panos Panay at this event and we heard a long backstory about the intricacies of its design and why everything is just-so. Unfortunately, it seems like the industrial design tomes referenced by Microsoft's esteemed designers skipped an important chapter - reparability. 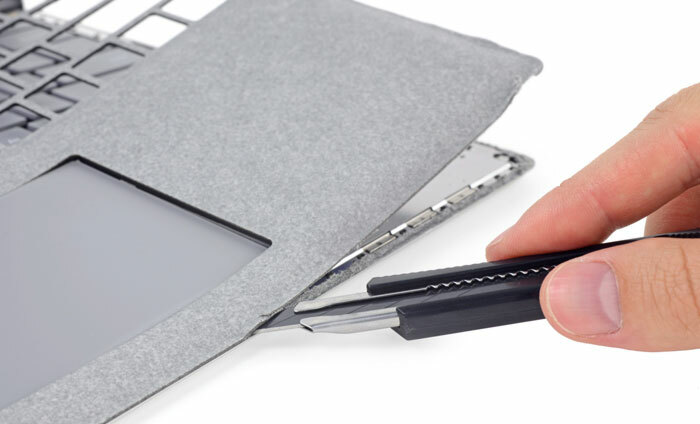 Just ahead of the weekend product teardown experts at iFixIt had a Microsoft Surface Laptop in the labs and scored it zero out of ten for reparability. Is there a chance that you could put that fabric back tidily? The Surface Laptop is a beautiful looking device which has great standard specs for a non-gaming laptop and can be configured with the latest Core i5 and i7 processors from Intel, from 4GB to 16GB of RAM, and from 128GB to 1TB of PCIe storage. However, you better get your initial config spot on, as there is little or no chance to upgrade anything under the carpet (Alcantara) later. 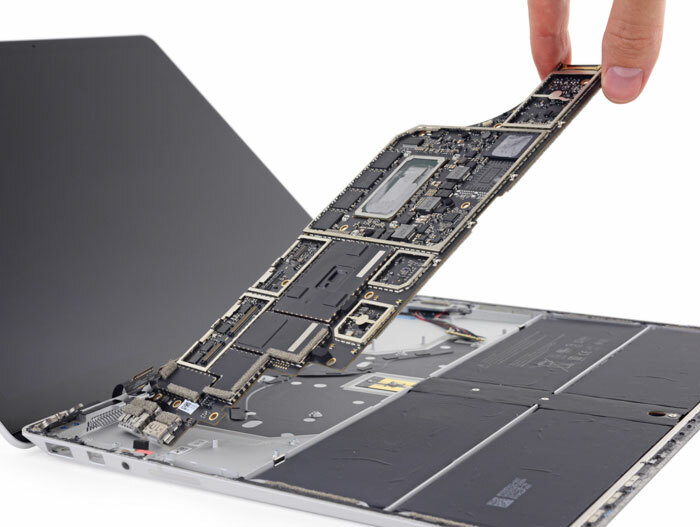 Explaining the Microsoft Surface Laptop's terrible reparability score, iFIxIt said "The Surface Laptop is not a laptop. It’s a glue-filled monstrosity. There is nothing about it that is upgradable or long-lasting, and it literally can’t be opened without destroying it." The bloggers went on to request Microsoft prove their opinion wrong, but with plastic welding in evidence that's not likely. From the glued chassis access points, to soldered or hard to access components, the Surface Laptop isn't meant to be tinkered with internally. You might be OK with having to decide certain performance specs up front but I'd be particularly annoyed that the battery replacement is "difficult and dangerous," as this is a laptop that Panos Pannay said would be give good service for a student throughout the whole of their university studies. That's at least 3 or 4 years isn't it? It's cheaper this way and they're taking a leaf out of other manufacturers books by saving costs by form fitting. I'd be particularly annoyed that the battery replacement is “difficult and dangerous,” as this is a laptop that Panos Pannay said would be give good service for a student throughout the whole of their university studies. That's at least 3 or 4 years isn't it? Some (most, I'd imagine) don't pay any attention to extending the battery life of their laptops, same as most people don't keep their OS and background processes clean at all, leading to complaints that their laptop stops working well after even a year of ownership. Having said that, well-designed laptops shouldn't need opening for the sakes of maintenance, and opening for the sake of upgrades can be reasonably regarded as a perk - modularity costs more than a streamlined all-in-one manufacturing process.